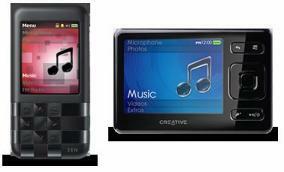 It has been a while since we heard from Creative and their Zen series of MP3 Players. The Zen Krystal came out a year ago with the Zen Mozaic, and they have recently unveiled two more in the Zen line. The Zen Mozaic EZ300 comes in 4 to 8 gigabyte models that feature a 1.8 inch TFT color display, an FM radio, a built-in speaker, a voice recorder, as well as an alarm clock. It has a mosaic keypad that is a “one-of-a-kind” design, and uses a plug and play system for dragging and dropping your songs. The Zen MX is a credit-card shaped player with 8 to 16 gigabtye models that feature a 2.5 inch screen with 320 x 240 resolution. It also includes an SD/SDHC slot, an FM radio,a voice recorder, as well as an alarm clock. The Zen Mozaic EZ300 is available for pre-order now. The 4GB is available for $59.99, and the 8GB version for $79.99. The Zen MX is also available for pre-order, with the 8GB for $99.99 and the 16GB for $129.99. Perhaps this would be better time for Creative to make a move to kill Apple’s semi-Monopoly on MP3 players. I’ve said this before: Creative’s Zen Stones are cheaper and better than iPod Shuffles. There, I said it. Deal with it, Apple.